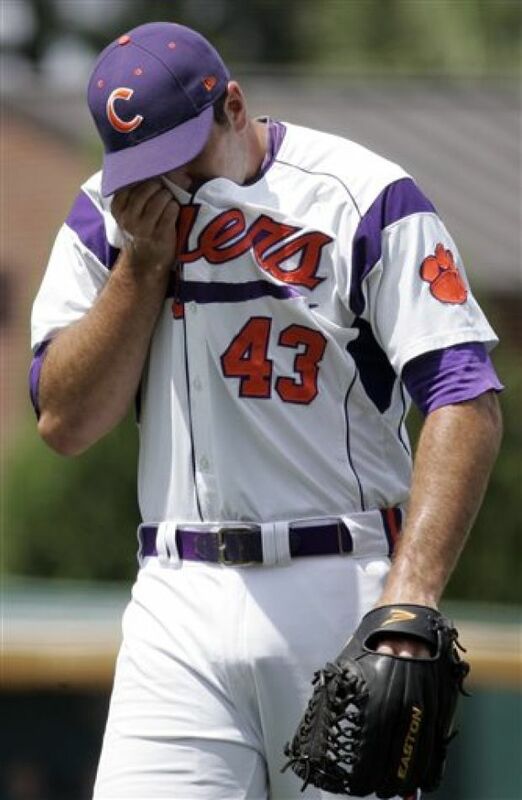 When the first pitch was tossed between Clemson and Miami, you knew it wouldn't be close. The question would be whether they would be doing the giving or the receiving. Unfortunately, it was the receiving. And the route was on. You could easily blame the Miami fiasco on the previous night's UNC meltdown. But I don't buy what many Clemson folk are selling - that the performance against Liberty was a continued hangover. No way. Not when that game was a week ago. Not with a group of 18-21 year olds. Not with a group of coaches with 20+ years experience. Not when playing in the NCAA Tournament. Not when playing in Columbia. And certainly not when playing against a team that fared better against USC than you did. This game was lost in the first 15 minutes. Erwin looked crisp in getting to two strikes, only to watch his out pitch get bounced in the stands. 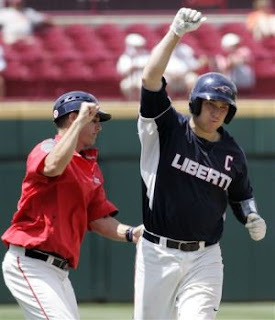 Liberty then showed Clemson they knew how to play by advancing a runner and scoring him on a sac fly. In the bottom of the inning, Clemson had a chance to take control of the game and show the bats were back. The first three batters reached safely, with team MVP at the plate. And he was told to bunt, something he hadn't done all season. He failed. So did the next two batters, and Liberty escaped with the game tied. Clemson rarely threatened the rest of the way. In the first inning, Liberty showed they were ready and focused, and would do what they do. Clemson tried to be someone different, only to fail. Increased hope for Liberty. New downward spiral for Clemson. Luckily for Clemson, they get an early chance to redeem themselves. Luckily for Clemson, all expectations have been removed, including ESPN. Luckily for Clemson, Saint Louis is on their own downward spiral. After the Billikins tied the game in the top of the 8th, they proceeded to implode in the bottom half, allowing SCAR to plate 4 runs. Maybe that will work to the Tigers' advantage. I think it will, and I expect Clemson to find some offensive rhythm against this Saint Louis staff. The Liberty trained just picked up all Clemson and ACC fans, but will it help? Can Liberty dispatch USC, and position themselves to advance? Possibly, but not likely. Liberty won't get the same pitching performance in round 2, nor will SCAR play into their hands. In the end, Liberty may keep it close, but it won't be enough to propel them past the Gamecocks. Hopefully Clemson gets a second chance at the Flames on Sunday afternoon. The only win over a BCS caliber conference is Miami's emotional win over Oklahoma State. While the ACC is 5-3, four of those wins were by host schools, while non-host schools were 1-2. For the SEC, all four wins came from host schools, while non-hosts were 0-5. Today will further separate the wheat from the chaff as non-host schools begin working their way through the loser's bracket. Expect those numbers to rise, slightly. Where are the Minds of Miami, Saint Louis, & Oklahoma State? I can't think of a game with more non-baseball storylines than yesterday's Miami & Oklahoma State game. Miami is without their Hall of Fame (and National Championship) coach, who stayed behind battling pneumonia. In the other dugout was Oklahoma State, still pulling pieces together from the previous tornados, had to learn another band was coming through their state. (How ironic that they played against a team with a national disaster as a mascot). Similar to Oklahoma State was Saint Louis, whose hometown and campus, was in the patch of the most recent tornado band. You could tell they played with heart and emotion, and you could see that emotion deflate as SCAR took control in the bottom of the 8th. Hopefully they'll be another version tomorrow as Clemson stays alive and readies themselves to play Liberty or USC in another elimination game.